Arabelle doing Arabelle things. This time, being companionable with her friend, Frau the frog, and saving a butterfly. Frau's tongue whipped out. The dragonfly dodged it. The frog croaked. A fly came buzzing low along the still, tepid-smelling water. It became a frog snack. "Hmm, small but tasty," she said to Arabelle. Arabelle smiled. Frau rarely got a dragonfly. But smaller flies were easy for her to catch with her long sticky tongue. Frau was sitting on a lily pad. Arabelle was floating cross-legged above another lily pad. A butterfly flitted tiredly over the still water, its flight so erratic it was in danger of falling in. Arabelle called out, "Hey, butterfly. You can rest on the lily pad with my friend, Frau. The butterfly had a tiny voice. But Arabelle heard it clearly. "I would like to come closer. But frogs eat people like me." "Frau? No, Frau wouldn't eat you." The frog croaked, then responded. "Now that the butterfly is your friend, I won't eat it. Although it does look tasty." 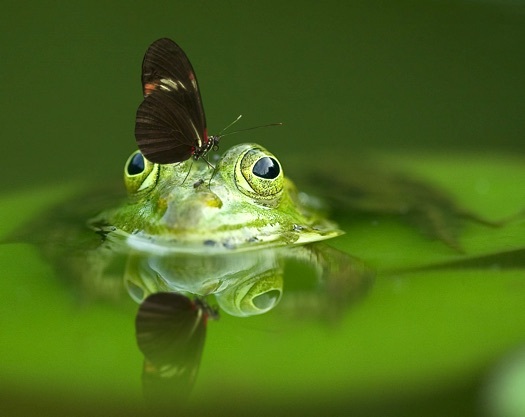 The butterfly said, "Are you sure, lady frog?" "Yes, I'm sure," responded Frau. "Rest on my head. My tongue only lashes out. It can't curve back to my head. You'll be safe." Arabelle smiled. Having friends was good. Use this form to send a private note to Will Bontrager, the author of Frau and the Butterfly.